I met Aretha Aoki during grad school in Western Mass about six years ago. She’s half Japanese, I’m half Vietnamese. We bonded over our hapa status and moved on to more interesting discussions (often at my kitchen table, with a bottle of Maker’s Mark) with fellow grad Vanessa Anspaugh, about art and life and how those things intersect. Aretha’s work interested me first in discussion; our first semester was built more around reading, writing, and talking. We weren’t necessarily rolling around the studio together much, so our connecting points were mostly concept and theory and how these would inform our individual processes. There was something vital to each of us about the role of “the Author” and what that meant to our interests in individual and shared experiences. We would consider mining the personal to build artistic treatments of the authentic-integrated-sincere Self. Our various experiments in performance and process (and life practice, really) would inevitably lead to an understanding of impermanence as a constant state that challenged static notions of artistic ownership. Impermanence, in a sense, ephemerality not just in dance but, in all lived experience, provided us with a grounding foundation. We were able to reflect on our own work within constantly shifting categories leading to clearer definition, greater expansion, and eventual decay. We worked together after surviving school and getting back to NYC and I’ve appreciated watching her choreographic work develop at various venues in the city. She’s currently a Fresh Tracks artist at New York Live Arts and the “Ephemeral Evidence” project caught her in the midst of that residency. The Solo Project that she will be investigating on Tuesday at Exit Art, looks at narrative, at a personal story that reaches “beyond the personality of the solo dancer.” For the day she’ll engage a relay process that she (and fellow EE artist Arturo Vidich) identified as a kind of ekphrasis, the transposition of one form to another in with the intention of conveying the essence of the original. She’ll begin the day alone, then will be joined by two dancers Lily Gold and Jessica Ray. They will move and write, generating stories based on the movement work. After they leave, Tanya Marquardt, a playwright, will arrive and write a play from their texts. Then an actor, Becca Kauffman, will arrive to read and record the play. Ryan MacDonald will be emailed the sound file and will develop a sound piece offsite. Kim Hennessy will arrive and create an installation with the play and the writings while Ryan’s sound piece plays in the space. 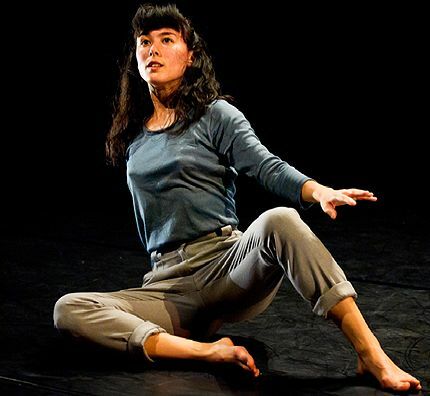 The project pulls apart the solitary nature of a solo dance by bringing other artists in to generate material and giving them license to create their own versions of the individual works. The choreographic authority is subverted in a considered sharing of authorship. And, in a pragmatic way provides Aoki with the chance to “work out some very early questions and curiosities” and with the opportunity to collaborate with a range of artists she might not normally be able to gather in one shot. I’m very curious and excited to see how dance translates into other mediums and also that these mediums can act as a container for a future dance and for all the dancing that preceded them. For instance Kim, who makes incredible, wild and intricate installations out of paper and cardboard and more… I wonder how her work–undeniably ‘object’–can point to, in its objectness, the dance (and maybe more) that is intangible. There is a focus on maintaining an interconnected relationship between the modes of expression and an egalitarian autonomy for each medium, reflecting Aoki’s interest in not privileging any individual form. In addition to a collaborative spirit, it engages a discussion around what she describes as disciplinary limits and how the different forms can inform and extend those limits. We recently had an exchange via email. When did this kind of interest (in not prioritizing) take shape for you? Is it based on the community of artists you find yourself among or did you have to seek out artists to make these ideas happen? I think there is a bit of both happening. Your work comes to mind as an example within dance, of the trust you would put in your dancers to make certain decisions and choices. So, there was not this sense that you had all the answers and our job as dancers was to give you what you want. I think in NYC in general, people are working for little or nothing and a hierarchical model simply doesn’t work. 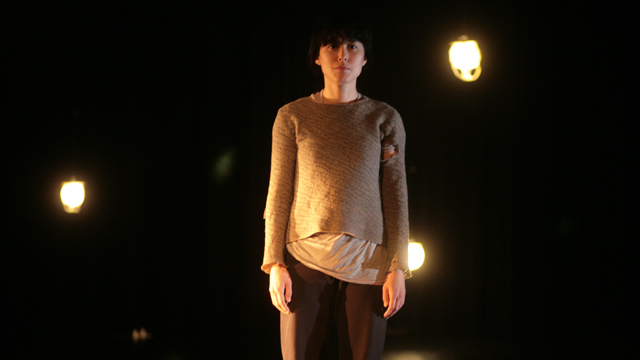 I’ve also worked in an interdisciplinary way for a long time, since I started making dances. The first dance I ever made, “Synergy” was a collaboration with Rica Kunitate and Debra Ao. We collaborated on every single detail on that dance…every movement, everything. I remember how painstaking it was but also, I discovered how that process resulted in a deep connection onstage. It was an “Aha!” moment about process and performance. I went to an interdisciplinary undergrad school in British Columibia—Simon Fraser U–and worked with my peers in the theatre and visual art departments. In some of my earliest works, I worked with actors and dramaturgs. I also formed the collective “kitchen” with visual artist Cindy Mochizuki and theatre artist Tricia Collins. We collaborated on making site specific, performance installations. We made it our mission to explore each other’s disciplines and make work that didn’t speak loudly as any one medium in particular. I think this experiment [for Ephemeral Evidence] is allowing me to return to my earlier practice of making work. By bringing additional dancers into this process, what are you saying about ‘solo’-ness and how do you hope to use their input? When you asked me to be a part of this experiment I had just begun rehearsals for my Fresh Tracks residency, working toward a couple performance opportunities. As far as any sort of plan, I had none, other than to go into the studio and see what was happening–generally, to be guided by intuition. I realized that at least for the purposes for these upcoming showings, I would be dancing by myself. I wondered what it means to be making a dance on myself. It felt wonderful and luxurious to not have to go through the scary process of being in a room with other dancers and having to direct them, and to be on no one else’s schedule but my own, but also very insular for the same reasons, especially because at that point, my research wasn’t grounded in any articulated ideas, just the mercurial voice of moment-to-moment intuition. So I decided to take the Exit Art experiment as an opportunity to work with other people, to find out what of the material I’ve been working on translates on other people and in other mediums. If I’m not dancing this material what of it remains? By working with Lily and Jessica, two people I don’t have a lot of history with in the studio but would like to get to know better, I feel like I can simply get an understanding of what it is that I’m doing. I’m leading them through writing and dancing scores I often do by myself to get into a sort of rhythm for movement. I want to know what kind of material these scores generates for them, to see how other people respond to what feels like personal choreographic motivations. I also want the practice of articulating the scores to other people. And of course, I’m very literally using their input-their writings–as material for Tanya to write a play. Did your time with Sarah Maxfield’s One-shot influence your interest in solo? I hadn’t thought of One-Shot, though it’s funny you mention it because Sarah and I hung out recently and I recalled how that experience helped me to get back into choreography in general after having taken some time away from making work. Solo work is just what I’m consistently drawn to. I sometimes feel a bit of shame around it–that ‘real’ choreographers make work on large casts–and even though that’s an absurd and judgmental voice I’m trying not to pay much attention to, I want to search for ways to relate the world of me in the studio to the world outside. You mention “layering and juxtaposing visual, written and embodied forms to both generate and disturb a sense of character, place and narrative.” What is it about narrative that interests you? Or rather the formation of narrative? I am very drawn to language. Language–poetry and short stories–are very generative for me. In rehearsal I may read a poem and then improvise, or shift rapidly between writing and dancing as a way to find a sense of rhythm. Within dance, I think of narrative in a very generous and open way, not linear at all. To me, stories exist all the time in performance–the stories that are carried in the bodies onstage, of the overall experience of a work, the stories that audiences bring into the theater. Stories don’t just exist in books, they are the way we make sense of the world. I feel like dance is a way to bring attention to these stories in a nuanced sort of way. You’ve described bringing together movement, text, sound and video, to allow for spaces where the unexpected can emerge. What is it about the un-expected that you are after? I think it’s related to the last question. I want to create a space where fictions are invited to exist but that they also can be undone, replaced by new stories, and so on. To me, the unexpected is that space of possibility where anything can happen and one’s perceptions are invited to shift a little or a lot. I’m also as a maker, I’m just not interested in knowing something from beginning to end. I want to create ways to surprise myself. What is your take on ephemerality and dance? Dance is ephemeral and that is a beautiful thing! Dance doesn’t last and neither do any of we and we are so lucky to be in a medium where we have to confront that always and maybe then reflect on our own mortality. And left with essentially nothing, the process or experience of making the dance becomes primary.